Guest Post by Maria Bella. I don’t know if anyone else has ever felt it, or it is just me. I sum up life needs in the 4 most important aspects to be considered -before spending valuable money. Number one is your family, then clothing, food and at last shoes. Wanderers might agree with it because your family is your ultimate responsibility, clothing and shoes are the reflection of your personality, and food is something that should be healthy, yet good enough to your taste buds. Out in the world there are many outclass cuisines that are enjoyed, especially from all over Morocco, Africa. Morocco is the land of aromatic spices, and exotic food recipes that gives you a tempting feel. Some food cuisines are derived from the Roman era while others let you enjoy the real Moroccan food. Spice up your love for food and show some real affection towards it, try the food with ingredients that adds up the taste to your life. Nomads are people who can easily adapt to the new and exciting changes and for them, food is something they can sacrifice anything for. It is only enough to have some tasty and different food to taste. Roaming around the local market of Marrakech, the aroma will lure you towards it. There are even times when their homes will grab your attention because of the delightful scent of yummy ingredients. The real way to enjoy the food is to feel its fragrance, breathe-in the aroma, and let your mouth filled with water by only gazing at it for a minute. That’s the way one can romanticize his breakfast, lunch and dinner too. So, foodies! 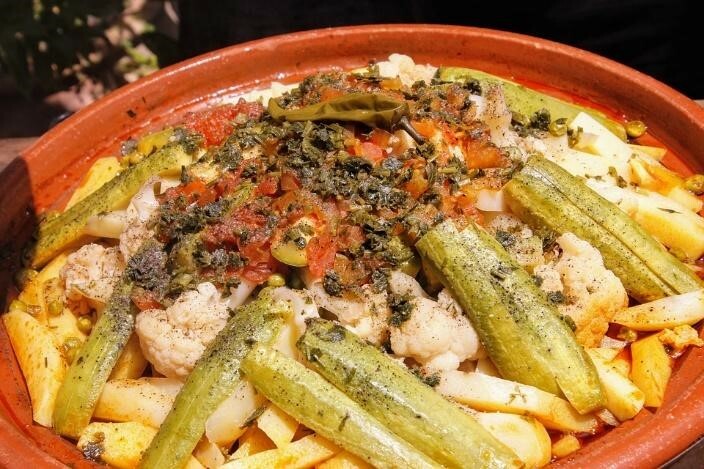 here we have a list of some must try dishes in Morocco. Apparently, Marrakech is the city of delicious cuisines but Tangier is also giving a hard competition nowadays. Let the spices melt in your mouth with the watery lamb cooked well with green olives (on choice). Tagine is more likely to be the national dish of Morocco. You can find it in any restaurant or a road side café where it is mostly served with breads. If you are visiting Morocco in the Holy month of Ramadan, you will find people breaking their fast with this particular dish. Harira is the common dish that is made from the ingredients like, chicken or lamb both, tomatoes, chickpeas, and lemon slices used for the garnishing while serving it to the guests. Whenever looking for irresistible food taste, one needs to look out for Zaalouk, prepared with salads scooped up with the bread. It is the combination of multiple salads, compellingly misty aubergine puree garnished with garlic, paprika, cumin and chilli powder. For instance, you are enjoying holidays in Fez, which is also known as another charming city of Morocco, inviting food lovers to taste the cuisine that is a pastry pie filled with pigeon meat including cinnamon, saffron that gives the aromatic touch to the delicious dish. Sweet and savory taste will also give you an idea of trying a new and unique recipe at a cooking class. Its aroma is enough to hold you, and its fragrance arises nostalgic feelings. Refresh your emotions with the best drink of the world, you will forget the wine or beer after tasting this once. The refreshing taste of mint gives a soothing touch to the mind. While you are looking to relax for a moment, cherish that moment with a special mint tea of Morocco. Bakeries of sweets can be found at every corner of the street. Mint tea serving with the pastries and other sweet cuisines. In Morocco a sweet dish is considered as a necessary part of every meal, and all people of Morocco have a sweet tooth. If you are a food lover, and admirer of the spices and smells, then Morocco is the land for you. Once landed there, you will feel the aromatic air. A country is supposed to be adventurous in every manner; many companies are proving you lavishing tours that include cooking classes, don’t forget to avail that. If you are an observer who loves to give at least a try to every new thing or activity coming their way, then you must try the foods mentions in the blog. Every city has its own taste that represent the regional and cultural differences of Morocco. Other than food, one will also get view of beautiful sights; moreover, tourists are always treated in a best way, they are invited to the local home cuisines every time. Accept the invitations and spend some wonderful time with the kind people of Morocco. Plan your Morocco Holidays now, and include all these dishes in your list! Hi, this is Maria from UK. Nowadays, I am writing creative, historical and informative articles about traveling. I am interesting in writing to provide unique and creative content that enable the reader to understand the traveling experience and take help to plan a Cheap morocco holidays decision on the basis of provided information. For the past three years we have traveled to Helen, GA for their annual Oktoberfest festivities with a few friends for a weekend in October. Our friends parents own a cabin in Helen and have graciously opened their home, and traditions, up to us these past years, forevermore converting us into Oktoberfest-aholics! Quaintly situated in the rolling hills of Georgia, Helen is a perfectly picturesque town modeled in the German style of architecture. It is a mostly touristic town, with it's main claim to fame it's two months of Oktoberfest festivities in September and October (longest running in the US I might add! ), but they still boast plenty of other fun activities throughout the year including the annual fasching event in February. Only a three hour drive from our hometown of Charlotte, NC, this makes for a perfect weekend getaway. We typically arrive on Friday afternoon and spend this time visiting and catching up with friends, sipping on some brews, and soaking in the beautiful scenery surrounding the cabin. Saturday we rise early; maybe go for a hike at one of the numerous scenic hiking trails, or like this year, explore a local corn maze. Lee Anderson Farms is a quick drive from the cabin, located in the small town of Dahlonega. We arrived at opening time, 10AM and moseyed on over to the charming barn to collect a bottle of water (included in the admission price of $10!) and check out the petting zoo before heading off into the maze! (As a side note can I just add that I have added "baby goat" to the list of animals I want to own that my husband says no to?) Now of course, we had to make things interesting and wager a bet. After hashing out the details, it was decided. Girls vs. Guys, loser takes a shot of stroh. (Not familiar? It's an Austrian rum that smells divine but unfortunately, tastes like gasoline. I was fooled the first year of Oktoberfest and have since learned my lesson. That stuff is an *ahem* acquired taste.) We snapped a few pics then headed off into the corn! Of course the girls crushed it and finished the course in a little under an hour. I can't really take any credit if I'm being honest, Mia is a whiz with a map and she has a keen sense of direction. Me? Not so much. It was a gorgeous day to explore outside! Sunny and blue skies! After coming home to freshen up and have lunch, we headed out into downtown Helen. The small downtown area is filled with local eateries, small chintzy souvenir shops, and numerous artisan shops with everything from handmade wooden cuckoo clocks to German-styled alpine hats. Of course we had to pick up a hat the first year we visited, and each year since have bought a commemorative pin to decorate and remember the years past. Before nightfall approaches, (the FestHalle fills up fast and we wanted good seats near the stage!) we make our way over to the FestHalle for a night filled with live music (polka of course! ), pitchers of Dunkle beer, bratwursts, and more rounds of "das boot" than I can count. Not familiar with das boot? You can purchase a boot from the FestHalle filled with beer. Everyone passes around the boot drinking from it before passing it to the person to your right. The person immediately before the one who finishes off the boot has to buy the next round. This is one of my favorite Oktoberfest games! The FestHalle has a good selection of food to go with that beer and you really can't go wrong with whatever you choose. Pretzels with beer cheese, bratwurst plates, sour kraut, German potato salad. It's all delicious! Men and women dressed in German livery fill the Fest Hall to the brim making for an entertaining and delightful night of merriment. We always leave red in the face (from dancing or beer I couldn't tell you ;) ) feet sore, and bellies aching from laughing. Did I mention Mia bought us cute suspenders for the trip? Unfortunately mine took a swim in the toilet right before this picture was taken. It was tragic and also comical. Story of my life! Oktoberfest is always a great time and we are so fortunate our friends extend the invitation each year to join them. We would definitely recommend checking it out if you are in the area! DID YOU LIKE THIS ARTICLE? Let us know! Share or comment below. Prost! You will find this item under "Onion Soup" on the menu - If they list it under "French Onion Soup" their menu is too Americanized and trust me, you want to try the real thing. We tried ours at a small cafe in the 10th arrondissement, next to the Porte Saint-Denis monument. It was a savory, cheesy, soup with a generous amount of all the good ingredients. Do not miss out trying this famous soup! a must have with your meals. Whether breakfast, lunch, or dinner you must have a cup of espresso. I noticed that Parisians won't give you much sugar with any kind of coffee you order. Good thing I'm used to black coffee! French espresso is made out of dark, perfectly roasted beans, brewed into a very strong (one or two gulps) tiny cup of coffee. The perfect energy drink to keep you going. Seriously, there is a coffee shop or coffee bar in every corner of Paris. A very common practice is to approach the "bar" (which is the counter), order your coffee and pastry or choice, and enjoy it while standing up at the counter. If you sit down, sometimes they will charge you slightly higher price for your snack. Some places will ask you if you want the counter or a table before you pay so they know how to charge you. DO NOT leave France without drinking -many- Cappuccinos. This creamy, foamy, chocolaty cup of perfection goes flawlessly with any croissant you choose. Yes, you can find good pizza in Paris too. Maybe because Italy is so close to France, we found really good pizza while in Paris. I prefer the ones with lots and lots of gooey cheese. One that comes to mind, the paysanne pizza. Lots of cheese, mushrooms, eggs, tomatoes, bacon and a dairy creme (that I have no idea what it was but resembled sour cream) in the middle...perfection. There are many to choose from. Kronenbourg 1664 (blonde beer), Cervoise Lancelot, Duchess Anne Triple, or my favorite, Blanche Hermine (wheat beer). Our hubby's like IPA's and it was quite difficult to find them around Paris. But, we stumbled upon a very cool little pub called Rivolux on 16 Rue de Rivole, which had IPA's on tap. The bar tender, was as amazing making mix drinks as he was friendly. Nice atmosphere, great company, good drinks. Life is good. My FAVORITE thing in the world is to eat a good piece of gooey cheese accompanied by a good glass of wine. Blue cheese, goat cheese, Gouda, Camembert, Machengo, Parmigiano-Reggiano, Gorgonzola, Comte Cheese, and many others are among the ones we tried every time we could put our hands on a cheese platter. yum. In Paris, a meal is not completed if you don't order wine. Whether you like red, white, rose, dry, sweet, sparkling, wine is the perfect companion to your lunch or dinner. Maybe the savory level of French cuisine is specifically designed to make your taste buds crave some wine. Maybe it was the fact that we were in Paris and wanted to try everything. Maybe is was the ambiance. Have some wine. You deserve it. If you visit the Palace of Versailles, just south of Paris, you can enjoy ANGELINA's royal-like selection of pastries. I tried a Strawberry cream cake that I only wish it was a little bigger. They have a few locations throughout the Palace and the gardens. You won't be disappointed. Perhaps the best pasta dish I've ever had. It was simple, yet incredibly flavorful. The combination of mozzarella, cheddar, provolone and Asiago melts in your mouth and will keep your taste buds engaged till the last bite. A classic made perfection. Creme is a type of custard that is very popular in France. You can find it in croissants, doughnuts, and other french pastries. Creme-Brulee has always been a favorite of mine. Creme with a rich layer of caramelized sugar...life doesn't get better than that. Plain, with chocolate, creme, caramel, Chantilly cream, fruit, at a coffee shop, restaurant, bar, or at a street vendor. No matter where you are or what time it is, you can find a place that will have crepes. Total paradise. **** READ ABOUT OUR OTHER ADVENTURES HERE! And you fellow traveler? what is your favorite must try? Comment below and we might try it out! Our three day jaunt in Rome was filled with some serious good eats. I can't think of one thing I ate that was just "meh", everything was rich in flavor and simply put, delicious. Rome had, hands down the best pasta and pizza I have ever eaten. The sheer number of items to sample can be overwhelming to a traveler so I'm going to give you a breakdown of the top 10 foods to try when in Rome! You can't come to Rome and not try the gelato. More simply put, icecream. Ranging in flavors from light and fresh fruits to deeply decadent chocolates and caramels, there really is a flavor for everyone. You won't have to search hard, there are shops on nearly every corner. I sampled the raspberry and chocolate and they were absolutely delicious. Not to be confused with a croissant (yes they look exactly alike but don't make the faux pas of calling it a croissant! ), this flaky pastry is the breakfast item of choice in Rome. Variations on the corneto are many, you can find them filled with chocolate (both dark and white) and cream. I tried them all -don't judge, it was for research (who am I kidding, I just really like a pastry) and I personally preferred the cream one, or corneto crema. Whichever way you order, these things are a must when in Rome. This cocktail was recommended by our traveling companion and resident one time bar tender, Stephanie. The negroni is comprised of one part gin, one part vermouth, and one part Campari and garnished with an orange peel. While not everyone was a fan in the group, I personally enjoyed the cool kick this stiff drink offered, especially after a long day of sightseeing. A very traditional Roman dish, this pasta is comprised of egg, cheese, pancetta, and black pepper. Grate a little Parmesan cheese over top and voila, culinary perfection. Filling and scrumptious this was a meal fit for a queen! Another traditional pasta dish in Rome, this meal is comprised of rigatoni pasta, prosciutto Norcia, and onions. I grated some Parmesan cheese over the dish because, well, you can never have enough cheese! This was my first meal in Rome and definitely set the tone for all the good eats to come. A very popular Roman dish, our Air BnB host, Helena raved about, insisting that we try it while visiting. Meaning simply, "cheese and pepper", the flavor of this dish is anything but simple. Each bite is cheesy deliciousness. Did I mention it was served in a fried cheese bowl?! The amount of options available in all of Rome for pizza are staggering but trust me, pick any and you wont be disappointed. This pizza was made to order with all fresh ingredients, each mouthful an explosion of flavor. I opted for the spicy pepperoni, olives, and tomatoes, and believe me when I say, there was not one scrap of crust left on my plate when we left. Superb! RELATED: PARIS: CITY OF LOVE AND MANY OTHER AMAZING THINGS! Or as I like to call them, pasta cheese packets. These little suckers are the perfect delivery mechanism for some cheese! Even those are not so adventurous with their eats will love this one. Stuffed with ricotta cheese and spinach served with a butter and sage sauce, these ravioli were definitely the best I've ever eaten. They were practically oozing with richness. Ok now don't let this one scare you off, but trippa is....well...its intestines. I know, I know, it sounds absolutely disgusting, but let me explain. The intestines are cleaned and prepared, then cooked in a tomato based sauce filled with various herbs and spices. I was worried it would have a weird consistency or displeasing taste but was pleasantly surprised at the smoothness of the meat as well as the tasty combinations of spices used to prepare the dish. I would definitely recommend branching out of your food comfort zone to try this one out. Husband and I ordered these yummy mussels as an appetizer on our last night in Rome. Not only did they taste like they just came out of the ocean but whatever sauce they cooked these bad boys in was divine. (Our waitress spoke no English and we spoke no Italian so we weren't really able to get the full gist of what sauce these guys were cooked in). Taking a guess, I imagine it was a tomato based sauce with some garlic? Whatever is was, it was heartstoppingly good. Well that rounds out my list of top eats in Rome, three days was not nearly enough time in the beautiful country of Italy (I'm already scheming ways to get back for a longer jaunt) but I think we really did Rome justice by packing in so much of the local cuisine in such a short time. What are some of your favorite dishes in Rome? LET US KNOW BY COMMENTING BELOW! Since it opened its doors in 2014, Good Hops Brewing has been one of my favorite places to visit in Carolina Beach, NC. I mean, this place is so cool and family friendly, I have no problem bringing in the whole family, (and the family dog...gotta love a pet friendly place!). RELATED: CAROLINA BEACH FAMILY WEEKEND. WHAT TO DO, WHERE TO GO. Crafting a good beer is seriously an art form, and the brew master (Mr. Richard Jones) at Good Hops Brewing is terrific artist. Each beer is carefully crafted with a perfect combination of hops, and flavor. Their beers are brewed daily using a three barrel system, keeping 8 different types on tap at any one given time. Beers are rotated and new flavors are created to satisfy any craft-beer aficionado. And don't forget about the seasonal beers! Porters, Stouts, and the delicious Bilyberry Wheat, brewed with fresh blueberries; believe me, it's awesome. The establishment is great too. The atmosphere is so cool and relaxed that you feel as if you want to spend hours and hours with your friends there. Besides beer, they also have juice and root beer for the little ones. Yes, kids are welcome here. In fact, they have a whole section with board games that you can freely grab and play. Or if you prefer to sit outside, you can relax on a bench, play some corn-hole, or venture to play a game of disc golf. Trinity Disc Golf Course is located on the property and it features a 9 hole challenging disc golf course (also appropriate for beginners). You can enjoy a good brew and exercise all at once. It doesn't get better than that. Good Hops Brewing also hosts events, live music, as well as tours of the brewery. You can rent the back banquet room, which features a beautifully hand crafted bar and a spacious room for any party needs. So whether you want to enhance your taste buds with their delicious brews, relax with your friends and family (including Fido), or play some disc golf, check out Good Hops Brewing next time you are in the Carolina Beach area. They are the best craft brewery on the island. By the way, my favorite beer on tap, the Donna Golden Ale is the perfect and most refreshing flavor, ideal for any occasion. DID YOU LIKE THIS ARTICLE? PLEASE LET US KNOW!!!! Share or comment below! So everyone with half a brain knows that New Orleans is famous for it's food. Throw a rock in any direction and I guarantee you'll hit at least six places worth eating at, so I'm gonna give you my top three picks for good eats. (Trust- this was HARD to narrow it down to only three). The first stop once we landed and checked into the hotel was to Red Fish Grill (thank you airport shuttle man for the recommendation). The restaurant itself is gorgeous from the decor, to it's prime location on Bourbon Street, this place has more than just good food, it has great ambiance. These Parmesan cheese grits were like puffs of clouds from the heavens, so light and airy. And as if they weren't good enough on their own, they were topped with roasted tomatoes, fried okra, jalapeno buttermilk ranch, prosciutto cracklin', and of course, shrimp. Everything was cooked to perfection, and the unique combination of flavors and ingredients was like sensation overload in my mouth. Louisiana crawfish tails, jasmine rice, veggies, herbs and seasonings all fried in a delectable little pie. (Reminds me of an empanada or mini shepherds pie). They came out nice and hot, flaky pastry outside and steaming goodness inside. These are definitely worth a taste if you are in the area. The turtle soup was awesome, great combination of flavors. Even you non adventurous eaters would enjoy this, no weird textures or flavors. Mia tried the jambalaya (which means of course I sampled hers too- that's how we do). And in our opinions, this was the best jamablya we sampled during the whole trip. The third and finale must eat stop on our trip was at the New Orleans School of Cooking (check out our blog post about the cooking demonstrations offered here). Not only was it awesome to watch our food being prepared and cooked right in front of us, but we were given the recipe to duplicate at home! 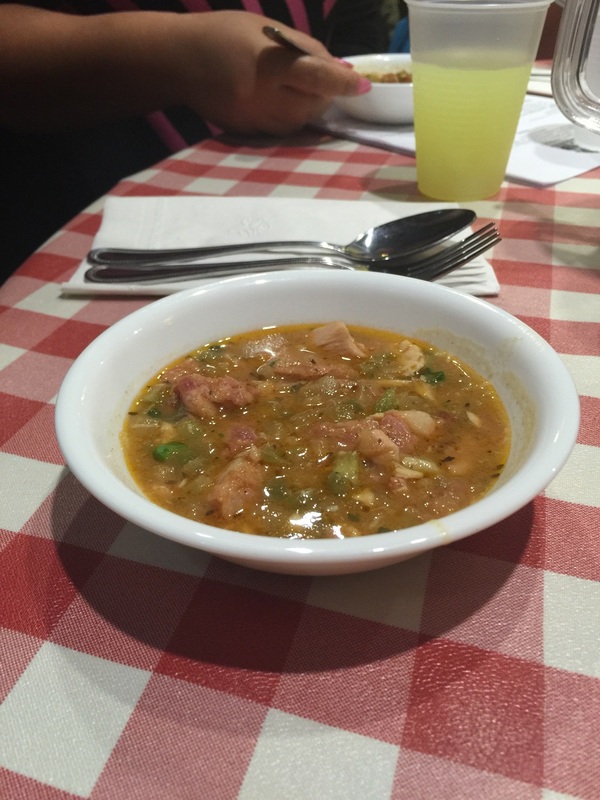 This gumbo was the BEST we encountered on our five day trip. It was so light and airy. Great combination of spices and flavors. Each table had an array of hot sauces which could be added depending on each persons personal hottness preference (sidenote: I like it HOT). But even if you don't add any additional kick- it was by far the best gumbo I ate. I know I said I was narrowing down my list to top THREE spots to eat but c'mon, can you really visit New Orleans and not stop by Cafe du Monde for beignets? Established in 1862 in the French Market it is world famous for their beignets. Be prepared for standing room only, this 24 hour coffee shop is ALWAYS packed. We got super lucky and snagged a table on a Thursday afternoon and man were they worth it. They came out hot, piled with powered sugar. We left with powdery hands and shirts, but with happy stomachs. Have you visited New Orleans? What is your favorite spot to eat? If you are looking for a fun, interactive way to learn a little (and eat a lot) of authentic Cajun cookin', look no further than New Orleans School of Cooking demonstration classes. Located right on St. Louis Street, The New Orleans School of Cooking offers classes, that typically last two hours, in which time a professional chef will cook a three course meal in front of an audience of roughly 60 guests and then, you guessed it, everyone chows down! When we visited New Orleans, we needed a good rainy day activity (since Friday was POURING pretty much all day) and this seemed like a good way to pass some time (eating is always a good way to pass the time in my book). We signed up for the class which demonstrated gumbo, jambalaya, and pralines and served water, lemonade, and beer from a local brewery, Abita. Our chef for the class was Ms. Anne, an adorably witty lady with 20+ years experience in the kitchen. She loves to cook, and you can tell. She was fun, hilarious, and knowledgeable without being boring, keeping the entire class engaged as she mixed, stirred, simmered, and boiled her way to a meal fit for a queen. The dining area was smallish- eight tables which could seat eight people a piece. The kitchen area had a large mirror overhead which enabled the entire room to watch the meal being prepared. Ms. Anne walked the entire group through the prepping and cooking of all three dishes interjecting her witty commentary along the way (seriously this lady was a hoot). I gotta say, we tried a lot of gumbo in our 5 days in NoLa and this was by far THE BEST, hands down, of any restaurant we tried. It was light and filling, PACKED with flavor (I'm not saying I did, but I may have had seconds). While the jambalaya wasn't as earth shattering as the gumbo- it was still pretty darn good. Fresh andouille sausage? Yes please! Guests were encouraged to come up for seconds, we definitely didn't leave hungry. While we munch on our gumbo and jambalaya, Ms. Anne prepped some pralines for dessert. I love me a praline, and was surprised to see how easy they seemed to whip up (Mia promised to make some when we got home- I'll let you know if she delivers). After the meal we were encouraged to look around the little country shop, which is actually the entrance to the facility. It was filled with various local sellers of spice mixtures, hot sauces, cooking implements, and general kitchen-y wares. Overall this was a really fun way to spend a rainy afternoon, we ate a great home cooked meal, came away with a couple recipes, and had fun chatting with the couples seated at our table who were also vacationing in NoLa. If you are interested in booking a class while you are on vacation, you can visit the link www.neworleansschoolofcooking.com for more information! **Read more about New Orleans food, drinks and places HERE! did you like this article? let us know!!!! Please comment or share below! thanks! !